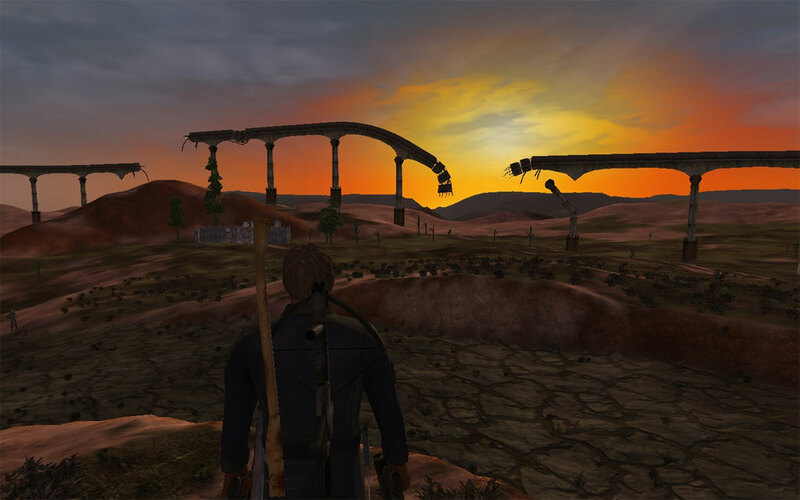 For my latest column at MMORPG, I made a return visit to Fallout Online Fallen Earth. It’s been over three years since I last checked in and a lot had changed, but even more remained the same. More specifically, all of the good parts — the crafting, shooting, exploring, humor, and stories — stayed in tact after the free-to-play conversion back in ’11. This was something I was worried about. The game didn’t seem to be doing too well and the freemium model was still finding its feet in a lot of ways. They could have destroyed the thing. I’m here to tell you, not only didn’t they destroy it, Fallen Earth is better today than it’s ever been. For the life of me, I don’t know why more people aren’t playing this game. That’s not to say there aren’t a lot. I played at multiple hours each day over my two week window and there was always, always lots of people running around. I was Grand Canyon region, FE’s massive newbie zone, so I’m sure that had something to do with it, but chat was rolling, people were asking questions and getting help, and everyone seemed be having a pretty good time. One of the Game Masters was even in chat accepting duels from players. How cool is that? What always made the game shine in my eyes was the combat, but I’ll admit, I wasn’t really looking forward to picking up the pea shooter I left off with. Something about getting headshots with paintball guns never sat right with me. What do you mean you’re bleeding? And no, you can quit faking dead right now. I gave you a welt, pal, so don’t pull this hemorrhage business on me. Thankfully, GamersFirst threw that right out the window and give you a pistol right away. Ammo is also incredibly easy to make, so I never even came close to running out. That changed the game for me. When I used to play, it was stiffly-animated melee or crossbow all the way. Give me a high-powered slug thrower, why should I ever turn back? Most early players seemed to agree, because everyone, and I mean everyone, I ran across was going ballistics. They also seem to have done away with the “chance to miss” on headshots. Every time I lined up a shot, it did damage. That always drove me nuts last time. The crafting game is really where it’s at, though. I lost so much time just going from node to node seeing what I could find and then piecing it all back together into something I could use. Everyone out there who complains that crafting should mean something, that it needs to be done right, needs to look to Fallen Earth. FE does crafting right. Not only is there a real-time queue, but with item wear and progressively improving recipes, you could play the whole game as a crafter, always be in demand, and be creating some of the best and coolest gear in the game. Especially vehicles. The only downside I see to this is that you still have to level up to gain AP and increase your skills. No combat-less play here. But frankly, I don’t care. Fallen Earth has the MMORPG genre’s best take on on first-person-shooting out there. Melee not so much. Darkfall takes that award. Mimicking Fallout? Hands down. And the cash shop can be wholly and completely ignored. I honestly don’t know how they’re making money. You are somewhat gimped playing free, but to be honest, I never once ran into a limitation. The slower crafting times are negligible for low level stuff and, really, I don’t think that much matters anyway. The whole game is open to you without paying a dime the entire way through. That’s pretty awesome, if you ask me. It also makes me feel a lot better about tossing down a few bucks when I do want a little booster. Along with Lotro this is one of the games I wish I could finish but just can’t seem to stay hooked to the game. And by finish I mean cap a character and have a good grasp on all the systems. You are right, the crafting is really well done in this game. I spent countless hours just making scavenging runs to build weapons, armor and vehicles. One thing I don’t like about the game is that the scenery doesn’t change much, one of the down sides of post-apoc genre I suppose. The color choices are so limited. Everything has to be dull earth tone colors. I often wonder how this game would do with a sci-fi setting which would of gave the designers more freedom. I wish I had more time to spend with it. With the bi-weekly tourist thing, it’s hard for me to make a lasting connection with games even when there’s a lot of potential. As a player who really gets into meaningful crafting, I love the way it works here and do the same as you. I usually pick a recipe, run and gather for an hour, make it, and repeat. Scavenging has turned out to be a major distraction to finishing and turning in quests! I agree on the color pattern. It is a bit samey. How far did you get in it? I’ve yet to dig into Northfields, but it seems much more green. Still earthtone, but I wonder if maybe things change as you get further in. But hey, at least hair can be any color in that rainbow. Need a burst of color, head to a newbie town and you’ll come across pink uber-spikes. Guarantee it! I had just started to make it into Northfields. In fact, I was making runs back and forth between sector 1 and 2 scavenging to help keep up my crafting. You can find all kinds of materials on that drive. As far as I know that’s your only two settings, desert or forest. I always wished they added a giant run down city as a sector. I feel like those type of areas are what kept me from getting sick of the same dull colors of Fallout games. Not to say they haven’t tried, you can make some cool color vehicles now which wasn’t in at launch.